The bindings we sell can be used with rollerskis or cross-country skis. The dominant binding system now is the inter-compatible Prolink / NNN / Turnamic system. We sell Salomon Prolink and Rottefella NNN bindings which will fit all boots using this system. We also sell the legacy Salomon SNS Pilot / Propulse / Profil system bindings. Bindings vary little between classic and skate in design. The main difference is the rubber 'flexor' at the front of the bindings, which changes in stiffness depending on whether it is used for classic / combi / skate or for roller or cross-country skiing. All bindings are supplied in pairs. Bindings prices include delivery within the UK and EU. For USA and Canada, see here. Suitable for all shoe sizes (ideally for sizes UK9+), available with either roller (red) or cross-country ski (black) 'flexors'. Suitable for shoe sizes up to 8.5, available with either roller (red) or cross-country ski (black) 'flexors'. (Front part slightly different to picture). Suitable for all shoe sizes (ideally for sizes UK9+), available with either roller or cross-country ski 'flexors' (both black). Suitable for shoe sizes up to 8.5, available with either roller or cross-country ski 'flexors' (both black). (Front part slightly different to picture). Lighter weight classic roller ski bindings. As Carbon CL binding, but with wider footplate at front. Rottefella Rollerski bindings are compatible with NNN / Prolink / Turnamic boots. Fits any cross-country ski fitted with the NIS plate. Rollerski-only skating binding, fits onto Xcelerator Rollerski Mounting Plate. Rollerski-only classic binding, fits onto Xcelerator Rollerski Mounting Plate. Rollerski-only skating quick release binding, fits onto Xcelerator Rollerski Mounting Plate. 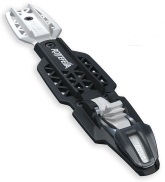 This is a plate mounted between a skating ski and Salomon Pilot Skate binding. It lifts the forefoot by 5mm, and provides a wider platform for the boot to rest on. (In black). Salomon Replacement Flexors - Flexors are the rubber stoppers at the front of the Prolink and Profil / Propulse bindings which provide resistance. Supplied in pairs, they are easily swapped over. These Prolink flexors were the for the original Prolink bindings introduced in 2016. They are fitted to pretty much all of the roller ski bindings we fit, and the original Carbon Prolink bindings. They come in different resistances for classic, skating and combi, for roller skis and snow. These Prolink flexors are fitted to the Prolink Race bindings and the majority of the bindings we fit to cross-country skis. They can be distinguished from the Type #1 bindings by having a hole in them for the screw to go thgrough. They also come in different resistances for classic, skating and combi, for roller skis and snow. Recommended Propulse Flexors for classic rollerskiing. The stiffer Flexor compensates for the added weight of the rear wheel.